Crafting posts are, admittedly, few and far between on this blog. It's not that we don't create anything, it's just we're a lot better at creating a mess than anything else. But when we do do craft, we do it in style. Earlier this year, The Boy and I went to #MadeInWakefield's Artwalk event to take part in a Faceless company workshop called Wired for Wellbeing. And. over the course of an evening, we each made a wire sculpture that looked like a genuine work of art, though that was entirely to do with the idea and not with the execution. Even so we were ridiculously proud and have been waiting for them to be exhibited since. Because when The Boy and I do crafting we EXPECT an exhibition. At the very least. 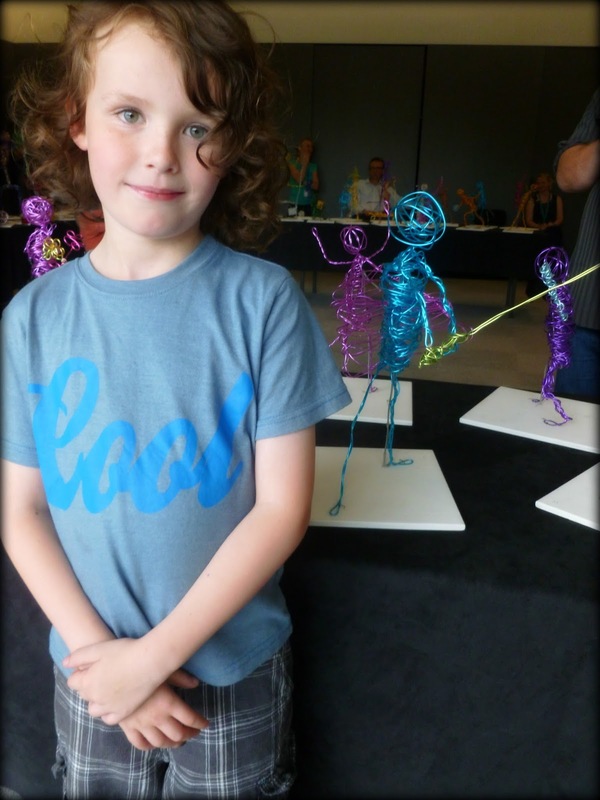 This week was the big day when we got to see the wire sculptures we'd made back in May (a while ago by anyone's reckoning but an entire universe ago to a seven-year-old boy) on display. And not just on display, but on display at Wakefield's, and Yorkshire's, newest award winning gallery, The Hepworth. 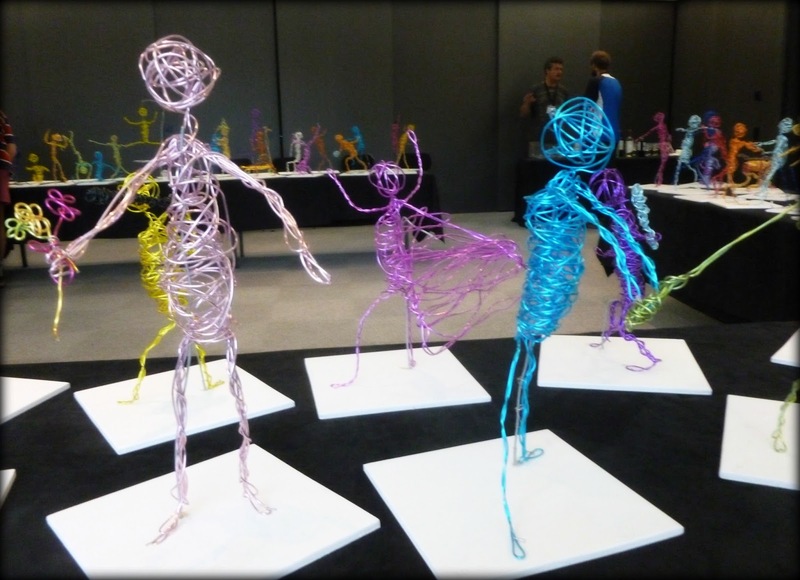 We were, as participating artists in the Wired for Wellbeing project, invited along to the preview evening. There were people and speeches and even free wine, though The Boy decided to stick to the apple juice. And he took, like a Frenchman to existentialism, to the role of exhibiting artist showing anyone who asked his sculpture, Boy With Lightsabre. Not even losing his temper when one well-meaning soul asked if he liked fishing. He just explained, patiently, that the sticky out bit was a lightsabre NOT a fishing rod, and gave only the briefest of eye-rolls in my direction. He was also enamoured with the rest of the collection and snatching my camera, strode around like a tiny David Bailey taking shots of his favourite pieces. And he did, when it was offered, seize on the chance of a tour of the rest of the gallery with a guide. It's a place he is very familiar with (The Hepworth being both near and free as well as an always interesting place to visit) and he loves it. Mildly disappointed that he'd already seen the current exhibitions, he still managed to make it through a 20 minute talk on post-modernism without embarrassing me. In a silence, he announced he wanted a poo. So we left the tour, slightly hurried and giggling. 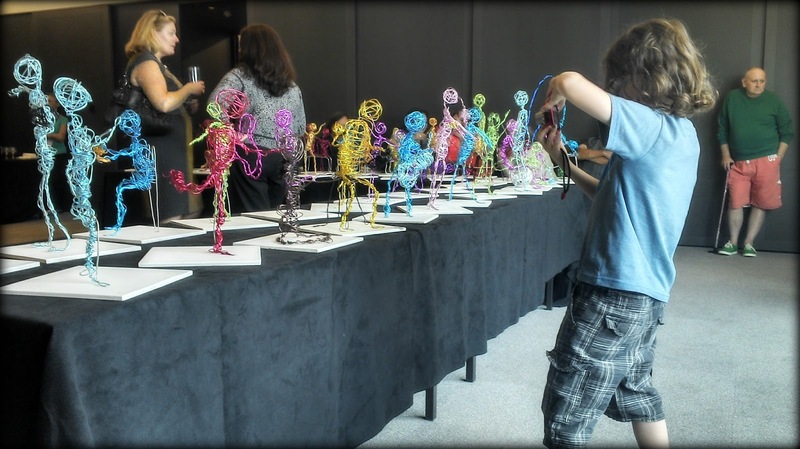 Later *cough* we took one last look at the Wired for Wellbeing exhibition, our exhibition. The Boy took a few more photos, I drunk a bit more wine.